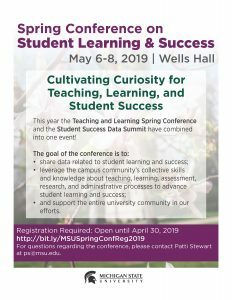 This year the Student Success Data Summit and the Spring Teaching and Learning Conference have combined into one event! The goal of the conference is to share data related to student learning and success, leverage the campus community’s collective skills and knowledge about teaching, learning, assessment, research, and administrative processes to advance student learning and success, and benefit the entire university community. Each May, we host a conference of MSU educators that showcase innovative teaching ideas and fosters a dynamic community of all who enhance the experiences of students, faculty, and staff. This year’s conference will be held on May 6-8, 2019 in Wells Hall. Registration open until April 30, 2019. Please contact Jill Bryant at AAN@msu.edu with any questions.